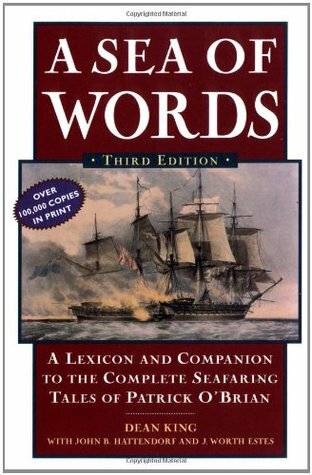 A Sea of Words is perfectly described by its subtitle: A Lexicon and Companion to the Complete Seafaring Tales of Patrick O'Brian. If you've invested any time at all in reading the 22-part Aubrey/Maturin series of nautical tales, you would be painfully remiss in not having by your side for quick reference A Sea of Words. You will not--I reiterate--you will not understand the nautical or medical terms O'Brian pours forth, not even if you're a seasoned sailor or physician. Why? Because these terms are specific to tall-masted, square-rigged sailing frigates, Indiamen, and xebecs of the early 1800's. In other words, O'Brian talks in nautical code that has been lost during the Industrial Revolution and era of mechanization.Peering within is like looking at the Shroud of Turin; it's like breaking the Enigma Code; it's like solving the Riemann hypothesis. Patrick O'Brian's anachronistic language, pervasive throughout, jumps to life when an unfamiliar word, verbiage of local color, or a Latin quote is disentangled by quick reference to A Sea of Words. The author has taken great care to dissect every book written by O'Brian, isolate the words that may have particular, rare, historic meaning to the story, and combine them in this book of reference. This is not a book that can be read independently, unless you like perusing the dictionary or encyclopedia before those references were moved to the internets.Patrick O'Brian must have lived a previous life as a seaman or Post Captain in the 1800's. If not, then I envision him having written languidly day and night among a midden of dusty, open, cloth-bound primary-source naval literature, a fire greedily stoked, and a single-bulb desklamp under which he pensively hunted and cross referenced ancient medical and nautical terms. I prefer a publication like A Sea of Words instead of 3-8 footnotes per page. I've read the first 3 in the Aubrey/Maturin series, the first without the Lexicon and Companion, the other 2 with it by my side. Again, it's quite necessary, and you won't enjoy O'Brian as much without it. It's a loss to the world of literature that Patrick O'Brian has passed away. I was excited about this when I got it, and it's been very helpful in general. But the more I try to use it the more I wish it was slightly more comprehensive. It does not contain quite all of the nautical and technical jargon I want to know. I especially wish that the diagrams in the front of the book showing the anatomy of a ship were much more detailed...in fact I could go for an extra ten pages or so just of these types of labelled drawings. The big things are listed but there are so many little pieces of the ship that are talked about throughout the books that are too small or tangential for little drawings like these. I also wish that there were maps that showed the locations, if not the actual courses of the travels made in each book. I may be getting greedy here, but all of these things would have made this book a lot more satisfying to me. The world has changed quite a bit since the period in which these stories take place, and I would have loved to see some maps showing the locations of all of these cities and colonies that no longer exist, or have become some other place. All that is just nitpicking though. Still a very useful and usable book in general. This is another of the reference books on the first shelf in my Shelf-Clearing Project. When I first read Patrick O'Brian's Master and Commander, it seemed as if there were whole pages on which the only words I understood were a, an, and the. Yet I loved it, and pressed on through many more of the Aubrey-Maturin series. This book was a tremendous help, as it would be for anyone who isn't a lifelong sailor and an expert on the Napoleonic era in sea warfare. It would be useful, too, in reading other works set in the same milieu. I'm keeping it, since I've saved the last two O'Brians for my old age, and very likely may reread the earlier ones as well. A great book giving in-depth insight into the workings, characteristics and developments of the 18th and 19th century wooden sailing man-o-wars. This is a must-have reference when reading the Patrick O'Brien books, which can become very confusing with their archaic terminology. Helpful historical pictures and useful graphics are provided, including the ship interiors and exteriors. The British fleet is mostly described, with some mention of the French and other nations. Providing clarity are descriptions of the daily life and rituals of those on board, definitions of the era lingo and dialect, the makeup of the crews, typical on-board schedules, and the military culture. Disease and injury, and the medical resources available for aid are also described, a reminder of the high fatality rate and sometimes brutal living conditions involved with the ships. Definitely keep this book around whenever you haul out one of the Aubrey/Maturin adventures. The start of the book describes ship types, the structure of the Royal Navy's bureaucracy, ranks and a lengthy piece about medicine at the turn of the 19th century. These were fascinating and a good introduction to the series. The dictionary part is very comprehensive, I have yet to look up a confusing word from the book and not find it here. The dictionary has nautical, medical and scientific terms along with important people, places and ships. There are also ship rigging and sail diagrams (so useful!) and maps of important regions. It is an encyclopaedia. It is not for everyone ... because it is an encyclopaedia. I read it cover to cover and found many sections, like Marthambles, hilarious and worthy of further study, which I then conducted. This book is basically a glossary of terms relating to ships, sailing, and the navy as per the Aubrey/Maturin series by Patrick O'Brian. If you are interested in the English Navy during the Napoleonic Wars it might be of interest to you, otherwise I recommend it only as a pre-read and continuing reference book while you read the O'Brian books.I started the first book in the series years ago after watching the great film "Master and Commander: Far Side of the World" (dir. Peter Weir) which is now one of my favorite movies. I quickly was overwhelmed with the terminology to the point that I couldn't go on without getting more info. I got a recommendation for this book and finally ordered for about $4 on amazon - it was money well spent! There are about 75 pages at the front of the book that give an overview of the structure of the navy and its fleet, the history of the Napoleonic Wars from about 1785-1815, as well as the basics of naval medicine and illustrations of sails, rigging, and a variety of boats/ships mentioned in the series. That gave me a great foundation to start the book and as I go through the first installment in the series I refer often (sometimes every paragraph) to the glossary. You could potentially skip over many terms if constantly referring to this book becomes annoying, but I figure that by looking at everything I can now I will more easily shed the need to look up all these terms as I progress through the series - which I am really enjoying! Beyond just ship/sailing terminology, it is a reference for all the colloquial/cultural terms and I would say try looking up even words you think you know because you'll find that at the time they may have had different meanings. Very useful and clearly written. Mine is the first edition, so some of the improvements I would ask for have probably been made. Without it, half of the words might well have been in Turkish or Icelandic. You know your recreational reading has gotten out of hand when you read reference book about it. The historical essays are essential and the the lexicon is very helpful. Usually when I shelve a book as "didn't finish" it's because I didn't like the book enough to read the whole thing. In this case, I used this book as a companion dictionary as I read first O'Brian's Aubrey/Maturin series and then began the Hornblower series by C.S. Forester. I'm marking it as read simply because I don't think I'll ever take the time to go through it page by page and read every entry. However, it is still a very good resource and helps make the vocabulary of these novels understandable and thus increases the enjoyment of reading the books. This is a useful tool as you are reading the Aubrey/Maturin series by Patrick O'Brian. It may be a good idea to skim through it once you've read the first book unless you are British and a mariner. The Napoleonic era language along with the naval speak are entertaining, but can be a little daunting at times. Like the girl in the nursery rhyme, when this book is good, it is very, very good, but when it is bad it is horrid. Dean King's Sea of Words is, as the back cover quote proclaims, "a godsend, a must-have book." Anyone who dips into the Aubrey/Maturin series is overwhelmed by the amount of archaic, period vocabulary on almost every page. And I don't feel that O'Brian is showing off just for the fun of it; I sense that he has so immersed himself of the writing of that time that it flows naturally from his pen. The sense of history is one of the aspects of his series that draws us fans to it again and again. Sometimes it's okay to pass over an unfamiliar word and just feel the sense of historical change; but most of the time I want to know what they're saying. So Dean King's book was tremendously helpful in giving the context for many, many word, phrases, and names. It's more of an encyclopedia than dictionary, filled with little details and explanations, and (far too few) illustrations.So why is it also sometimes horrid? Because of the number of times I looked up something unfamiliar and found that there was no entry for it in Sea of Words. It was infuriating to look things up and wonder: Is Dean King so literate that he thought this phrase was just common sense? Or was he skimming the novels and missed this one? Or did he just not know what it was, either, so he left it out? Sometimes this would happen several times in a row, and it's amazing how annoying that little tiny thing--stopping my reading and picking up the other book, then not finding what I was looking for--could be.It's a shame that this third edition (and very probably the last-ever revision) was not quite as perfect as it could've been. Besides adding more entries, I'd like to see pronunciation help for at least some of the terms, as well as many more illustrations throughout. A lot of this extra information could, I'm sure, be found online, but I prefer it in print form, because I'm more likely to have another book with me while I'm reading an Aubrey/Maturin novel than a computer open, ready for web-browsing.Sea of Words is good, but I wish it could be a little better. Even so, it's most definitely an essential for anyone who is going to spend time in the Aubrey/Maturin story. Invaluable compliment to the Aubrey Machurin series and any reading about the tall ship era. If you are an Aubry/Maturin fan and didn't actually sail on a British Man of War circa 1807, this book is your essential companion. Here you will learn about the various kinds of vessels that O'Brian mentions (pinks, snows, polacres, etc.) but also all the cat-harpings and hawser-laid cables, and mouses (a part of the rigging) that one encounters in these books. In addition, there is a fascinating chapter on the medicine of the age--what did Dr. Maturin know about the body and what did he do with that knowledge? Mini-essays on the management of the Royal Navy, Ranks, and other nuts and bolts allow the reader to attack O'Brian's 20 Jack Aubry books with a better handle on the background and vocabulary. And, as a bonus, most of the dialog in foreign languages is translated, so when folk are speaking French, you can read it in English (if your French needs a little help). The only reason this is 4 and not 5 stars is that I would have liked more information about the mechanics of sailing the ship, the layout, and other information that would make O'Brian's world even more concrete to the reader. This book is a great companion to the Aubrey/Maturin novels. In them, O'Brian diligently maintains authentic dialog, uses accurate technical terms, and doesn't break the resulting immersion by explaining those things. A reference like this is, therefore, absolutely essential to fully appreciating the work that O'Brian has invested in the reader's total envelopment in the world he's both recounting and remaking.In a complementary work of excellence, King brings us easy access to, and understanding of the rich world of detail O'Brian has constructed. King gives attention worthy of O'Brian to defining, explaining, and connecting the most trivial and obscure of terms, locations, and historical events and persons.I don't know that I would have enjoyed or appreciated O'Brian's work nearly as much if I hadn't had King's by my side throughout. If you are reading O'Brian's Aubrey/Maturin series and are not already a master of 19th century British jargon, both slang and official nautical terms, primitive medical techniques, famous naval people and battles, and a variety of Latin, French, Portuguese sayings, you should own this book. I'm presently on book 12 of the 21 book series and have this by my side at all times referring to it often. There is rarely a word or term that I've sought out that wasn't there and it helps provide clarity in what can sometimes be an overwhelming sea of words. See how I did that? I highly recommend this to anyone emerged in the Aubrey Maturin series. It's easy to use, well though out and a priceless resource to getting the full enjoyment of this amazing series. I've only had time to browse through this briefly, but so far it looks to be exactly what I was after. It's quite a thick paper back - nearly 500 words or so - with chapters that cover the structure of the Royal Navy, naval ranks, the Napoleonic Wars, and contemporary naval medicine. There are also maps, diagrams of various types of ships, and a large lexicon covering all the various types of naval jargon and period slang which appear in the Aubrey-Maturin books. I can now happily say that I know what figgy-dowdy is.For those of you may be looking for a guide to help understand the series, I can recommend this highly. One does not need historical background essays or a lexicon of Napoleonic era naval terminology to enjoy Patrick O'Brian's Aubrey/Maturin novels, but it sure doesn't hurt. Every time I consult this to look something up (What's the difference between a xebec and a felucca? What advantages might a carronade have over a cannon in a sea-battle? What's the relationship between the Admiralty, the Navy Board, and the Ordnance Board?) I follow threads to other entries and get lost for a bit before I return to the novel. I own the second and third editions in (well-worn) paperback, and have the second edition on Kindle. Highly recommended for anyone embarking on the Aubriad. This is one of those books I've lost, and wish I could find again! I used it extensively when reading the first volumes of the Master and Commander historic naval war series by Patrick O'Brian. I found the nautical and ship terminology daunting prior to purchasing this book. However there is much additional valuable information included in this book; it can be considered a primer for understanding the culture and times of which the Aubrey/Maturin series takes place. I really wish I could find this book again! An absolute gem! This is indispensable if one is reading Patrick O'Brian's 'Aubreyiad,' or for that matter, any historical naval fiction set during the Napoleonic wars or War of 1812. This is an incredibly thorough and comprehensive lexicon covering all things nautical, natural science, medical, as well as political and social. I highly recommend having this on the shelf if you are planning to read the Jack Aubrey/Stephen Maturin novels. I don't know that this is a book one reads cover-to-cover, but it IS one in which I could spend hours jumping from reference to reference. In front of his nautical lexicon for Patrick O'Brian's stories are articles on the composition of the Royal Navy during the Napoleonic Wars, 18th Century medicine, and illustrated sail plans and rigging for ships mentioned in the Aubrey-Maturin novels. Get this book and you'll be able to develop a deeper appreciation of O'Brian's masterful works! This is a MUST READ if you are sloshing your way through the Aubrey-Maturin series. If you know nothing (like me) about ships, sailing, the Napoleonic wars between Britain, France and Spain, this appendix will fill the gaps in. O'Brian's style of writing assumes that you know just as much as he does about sails, lee, starboard, larboard, etc. etc. etc. ... and that is some of the charm of the books. My Endorsement (per Barry):A must have while reading through the Aubrey/Maturin Novels. I keep mine right on the table under whatever O'Brian novel I am currently re-reading!My Review (for Barry):A-B started a little slow, but by C things really picked up. I loved how E followed D, and I never saw the twist ending in Z. Definitely the best dictionary I've ever read! Great companion book to the Aubrey/Maturin series, and a must-get after you're through the first three books or so. I don't refer to it a lot, but enjoy flipping through it and reading bits and pieces of time, and it's a great refresher.When I re-read the entire series in a few years I'll put more work into understanding the ships from these diagrams, and really absorbing the vocabulary. I have not read the entire O'Brian series, but I adore this lexicon. If you are a 'word person' who likes to browse dictionaries, learn antiquated words, and glean information about technologies of times past, this book is for you. And yes, it is also a handy reference when one is reading historical fiction--particularly of the nautical variety. This book is a fantastic companion to the Aubrey/Maturin novels, and generally comes down from my shelves each time I finish a jaunt with Jack and Stephen. Of particular value to nerds like myself are the illustrations of different kinds of ships, as well as different riggings and labeled sail diagrams. Studding sails aloft and alow! This book is an invaluable companion to the Aubrey-Maturin series. I wish I'd picked it up earlier in my reading of the books, but I'm looking forward to rereading them with this next to me. It greatly enhances one's understanding and appreciation for the books, and the essays at the beginning are interesting and useful as well. Dean King John B. Hattendorf J. Worth Estes - I like to read, wander cross-country, travel in cultures I don't understand, cycle, play squash, and I'm a foodie. But most of all I like to be in the throes of writing a book. This is invigorating work. The moment when the hard-won research combines with a bit of sweat and blood and occasionally a tear to become a fluid paragraph is like no other. What I hope to achieve is to suspend time and disbelief for the reader and carry her or him into another world, where they live more fully and in the moment.